Fine art, Illustration, graphic design and the art philanthropy of Sam Morrison: SUMP! Goes to Jail. The second photo is for photofridays "conspicuous" topic and for illustrationfridays "cold" topic. SUMP in the holding area of the police station. The municipal bldg and police station are attached. SUMP upon release from "jail"
For those of you who may not have been following my VOTE SUMP! Public Art Project here's the concept in a nutshell. 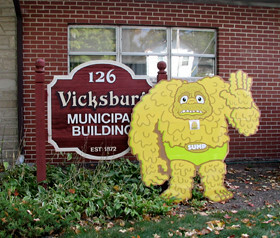 I created a ficticious character to run for a ficticious office in Vicksburg, Michigan. 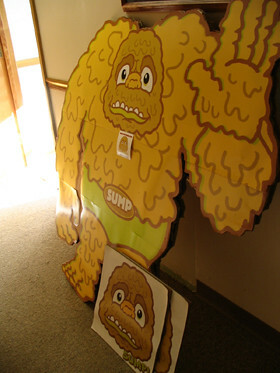 This ficticious character's name is SUMP! He's running for the ficticious position of Sewage Commissioner. The goal was to treat this character as if he were a real candidate. That meant he would be promoted via flyers, yard signs and a web site. The project was created to be family friendly and for the enjoyment of Vicksburg residents. (Read my other posts from 9/19/05 to get a more detailed picture of how the project progressed). 12:00 am Monday morning marked the official roll-out date for SUMP. Joined by a buddy of mine from work (he was also the one who coded the web site) we set about preplanning the placement of window clings, mini-sump posters and two large sumps around town. After the pre-planning we hit the streets and got down to placing Sump "stuff" in CONSPICUOUS public places. In addition to braving the COLD weather we were trying to stay one step ahead of the cop who was on duty. Since my public art projects are done anonymously and without permission there's an inherent risk that a project can go down in flames very quickly. I've developed some safeguards to keep my projects from failing even if the police take down major portions. But, I have to admit on this SUMP project there was very little I could do to safeguard myself. It really was an all or nothing project. For awhile everything was going very smoothly until we made our way to Main Street. We managed to avoid the cop on a previous occasion but this time he spotted us. I wasn't too freaked out because I hoped he'd see that this was totally harmless and for the enjoyment of the community. No laws being broken... just a citizen giving back to his community. If he were community minded he'd possibly allow the project to continue. That's the benefit of living in a small town. After the first 30 seconds I knew it was done. In fact he had already taken down the two large SUMPS placed them in his trunk. In addition he also had taken down most of the window clings. Even more, he took down my 11 paintings I placed a week prior. Anyway as we talked he proceeded to tell me how this could be considred graffitti or littering. As I mentioned this is the riskiest part of doing public art anonymously. It's all or nothing. His point was valid about not having permission. Anyway, the officer said I could pick up SUMP in the morning and I was welcome to talk to the village manager about proceeding further. (Keep in mind I sent the village manager a box of SUMP merchandise with a note letting him know a public art project was going to be underway soon). That safeguard didn't work. Seeing that SUMP doesn't have friends in high plces he had to spend the night in "jail". So long story short, I introduced myself to the village manager (that morning) and explained what my intent was about this and future projects. He is a very likable person and I felt our discussion went well. He was totally fine with my paintings being left around town. I only needed to let the police department know beforehand. I should mention the village office had one of my abstracts hanging near their window, as well as, one of my smaller character drawings. So apparently my art had been well received. Although I didn't ask to proceed with SUMP I knew it was going to happen the way I'd planned. So he (the village manager) kindly released SUMP and some other confiscated pieces to me. He also allowed me to take a photo of SUMP inside and outside the Village building. Like I said he is a very likable person. He even suggested I get a photo of SUMP next to the police cars. That didn't work out though. So what's next for SUMP? Vicksburg residents haven't really been exposed to SUMP yet. Although one local business found a mini-sump and emailed to say how much they loved the idea. So right now I'm exploring other ways to expose the community to SUMP. Be sure to check out the SUMP! web site and play the game.